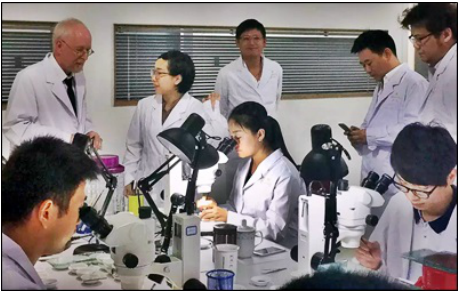 The AMCHPR has greatly broadened its scope of inquiry since then: now not only VCMs but the entire range of Chinese made timekeeping devices including past, present and future clocks and watches, including modern "smart" technology..
At the Koncise Watch enamel labs, Beijing, 2015. Although many historians view China as the cradle of human time-keeping, with early types of Chinese time-keeping devices dating back over 4000 years, it was the introduction of modern European clock design to the Chinese Emperor's court by a Jesuit Monk, Matteo Ricci (1522-1610), that re-ignited Chinese clock building after centuries of slow progress. China's first "modern" clock-building workshops were established in the Ming Dynasty (1600) by Ji Tanran. Small workshops emerged in Guangzhou, Shanghai, Suzhou and Nanjing. This was followed by a royal clock-making service being established in the Qing Dynasty (1723) by Emperor Yongzheng, taking Chinese clock-making to an early peak during the reign of Emperor Qianlong from 1735 to 1796. 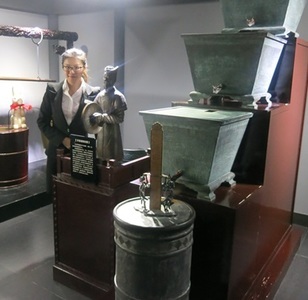 China's first industrial-scale clock-making factory, Yantai Polaris Timepiece Factory, opened in 1915 and is still currently in business, having celebrated its 100th Anniversary in the summer of 2015 (a wonderful event attended by AMCHPR curator, Ron Good, who is grateful for the hospitality). Chinese domestic watch-making, on the other hand, only began in the early 1950s, with the earliest three factories being established in Shanghai, Tianjin and Beijing under direction from China's Ministry of Light Industry. These initial factories were quickly followed by hundreds of additional factories of various sizes during the 1960s to the mid-1970s, some of which still survive today. Shanghai a-581. Tianjin Sea-Gull 51/WuYi, Beijing BS-1 (BS-1 photo of another collector's example). First models from these factories. 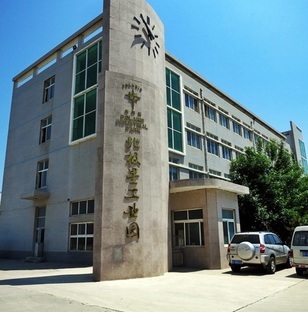 Many of those early watch and clock factories, though, were crippled and/or crushed by the huge changes China's (and the world's) clock and watch industry experienced during the 1960s and 70s. The many changes that occurred in China in the years before and following President Richard Nixon's visit in 1972 led to the relaxing of previously existing trade barriers. This was concurrent with the so-called "quartz revolution," which hugely impacted western watch-making countries like Switzerland, Germany and the United States, and decimated the mechanical clock and watch industry in China as well. Consequently, the mid-late 1970s and eighties were an especially tough time for (especially) mechanical watch and clock factories, world-wide. 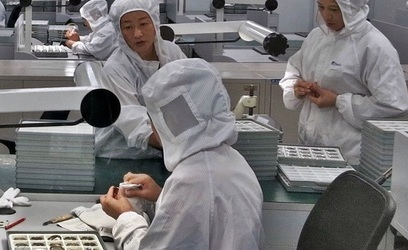 Despite these earlier setbacks, China's horological industry has rebounded and is now challenging the established leaders like Switzerland, Germany and Japan, certainly in quantity but also--increasingly--in quality.